Blackmagic Design today announced a major update for its Teranex 2D, 3D and Express converters. The Teranex 3.1 update adds a new software application that lets customers remotely set up and change settings on their Teranex converters from a central location, as well as adding a new 12G-SDI to quad HD-SDI conversions to Teranex Express. 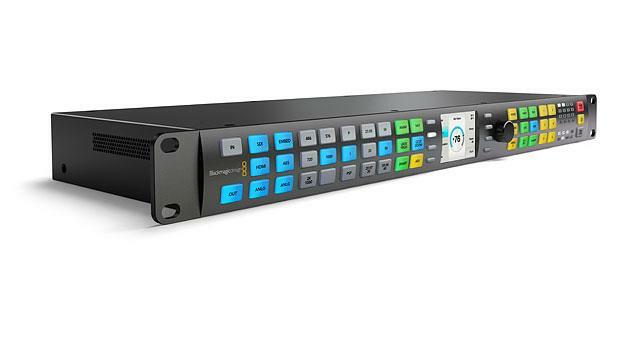 Teranex 3.1 update is available for download free of charge from the Blackmagic Design website. Teranex 3.1 update includes a new centralized control software application called Teranex Setup. Available for both Mac OS X and Windows computers, Teranex Setup lets customers remotely setup and control their Teranex 2D, 3D and Express converters. The software will automatically find Teranex converters on the network and and then take control of all features in the device. Teranex Setup features an intuitive and elegantly designed user interface that makes it easy for customers to access all of the most popular features like source and output selection, proc amp, color correction, aspect ratio, audio mapping and more. Settings made on the computer are changed instantly on Teranex, giving customers the ability to make on the fly adjustments to their live video feeds. Teranex Setup is ideal for both small post houses and large broadcast customers. Smaller facilities can use it to share a converter with multiple users, while bigger customers can use it to manage and centralize the control of multiple converters on a large network. The new Teranex Setup software is easy to use and supports the latest technologies such as high resolution “Retina” displays found on today’s computers. Teranex 3.1 update also gives Teranex Express customers an amazing new conversion features for managing high frame rate 12G-SDI connections as now Teranex Express can convert a 12G-SDI Ultra HD video feed into Quad Link 3G-SDI video. This Quad Link 3G-SDI is used on any Ultra HD monitor where the Ultra HD image is made of 4 x 1080HD SDI resolution video “tiles” that are recombined in the monitor as an Ultra HD image. Each of the Quad Link 3G-SDI feeds could also be sent to an independent monitor when creating video wall Ultra HD displays from four 1080HD resolution monitors. The update supports Ultra HD frame rates ranging from 23.98fps to 60fps. That means Teranex Express can now be used for outputting Ultra HD to a wider range of display devices, including video walls, large LED screens and older 3G-SDI equipment. Because this update adds 30 and 60fps Ultra HD support to Teranex Express, customers now have a choice of up to 227 different types of conversions. Teranex 3.1 update is available now for download from the Blackmagic Design web site free of charge for all Teranex 2D, 3D and Teranex Express customers. To purchase Teranex, or for more information, please visit Safe Harbor.